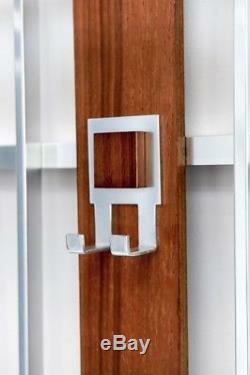 Vintage Mid Century Retro Danish Teak Wall Mounted Coat Rack. 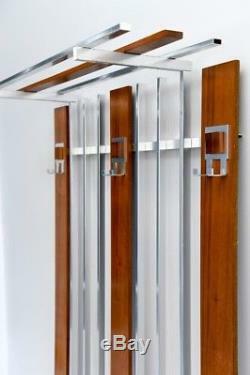 1970s teak laminate wall hanging coat rack. Functional as making a statement in the entrance to your hallway. 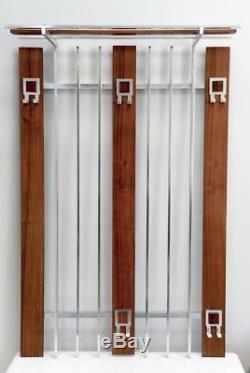 Wooden slats finished in teak mounted onto an Aluminium frame. The top shelf hat rack is made from the same material and easily detaches for storage or transport purposes. 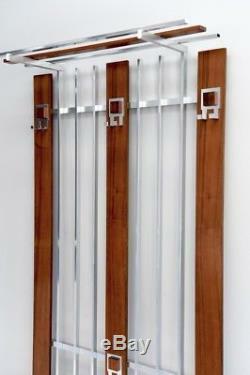 There are five aluminium hooks on the wooden panels and the rack can be mounted to the wall with screws or hooks. A stunning piece and in used vintage condition. As a rule all of our pieces are in good to excellent vintage condition. Please remember that if a piece is in original condition, minor wear should be expected. Our goal is to provide you with pieces you love. We're happy to discuss any concern you may have before purchasing. The item "Vintage Mid Century Retro Danish Teak Wall Mounted Coat Rack" is in sale since Thursday, November 16, 2017. This item is in the category "Antiques\Periods/Styles\Modernist". The seller is "ant99jones" and is located in Barnet. This item can be shipped to United Kingdom.